After creating a blog in blogger, we usually start creating articles to be publish. As we published our new post blogger with automatically generates the post URL based on your post title. 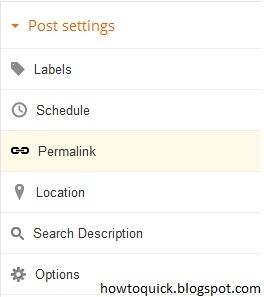 A new feature in blogger called Permalink where you can edit the post URL based on your desired URL of the post. This tips is very useful when your aiming to optimize your blog visibility on Google Search Results. Making the right and descriptive permalink to your post may help your content rank when it is indexed by Google. In doing this part make sure you don't over optimize your URL as Google will penalize you when they found you are doing that dirty tricks. Use this tip on the right way, describe what your content is and who are your target readers on the content you trying to publish. Google has a strict policies in terms of optimization, I'll advise you not to focus on SEO first instead publish good quality content as that will give you better chances of getting approved by Adsense. 1. Login to your same Blogger account. 2. Open the desired post you want to edit the URL. If the post is a published one click Revert to draft button to enable Permalink editing. 3. Then click Permalink in Post Settings. 4. Tick Custom URL radio button and type the new post URL in Custom URL text field. After typing the URL click Done. 5. That's it and you're done! This is just one of the good features on Blogger, just explore and read more to gain more knowledge on how to improve your blog. Do take time also to study about meta tags and other blogging techniques over the as this will help you learn and apply all you know for future blogging.